What is Drophip? Create your business online without investment. Find out how this business model makes you earn from working at home. You will often hear the words: supplier, wholesaler, manufacturer … ..
all these terms in our daily use unite them with a single word “Supplier”. seller to have their own income. to an end user, without having to first purchase and deposit in their warehouse. that in this case we call “dropshipper”. This will send the product directly to the final customer. through stores (e-commerce) or web pages. to create your business on the Internet working from home with a minimum investment. because it is the supplier that earns us, leaving a margin reduced to the seller “. I want to unveil a secret: Amazon, Sam Club, Costco are Dropshipping resellers! Do you think companies are not earning? I’m sure the information you’ll find on this page has never been found in Italy. it is and will always be the CLARITY of your INTENTIONS. Perhaps you do not yet have enough data to evaluate if dropship is advantageous or not? he analyzed costs and earnings to decide whether or not to launch his business with Bazarissimo. The descriptions must only adapt them to make them more attractive according to the audience they intend to involve. It must not manage warehouses, stocks, electricity, taxes etc. Paolo has decided that he will upload 64 articles to his e-commerce and expect an average of 7 sales per day. which has already been done previously. 16 hours saved because it uses the images and part of the descriptions provided by Bazarissimo. Now Paul must determine the value of his time. 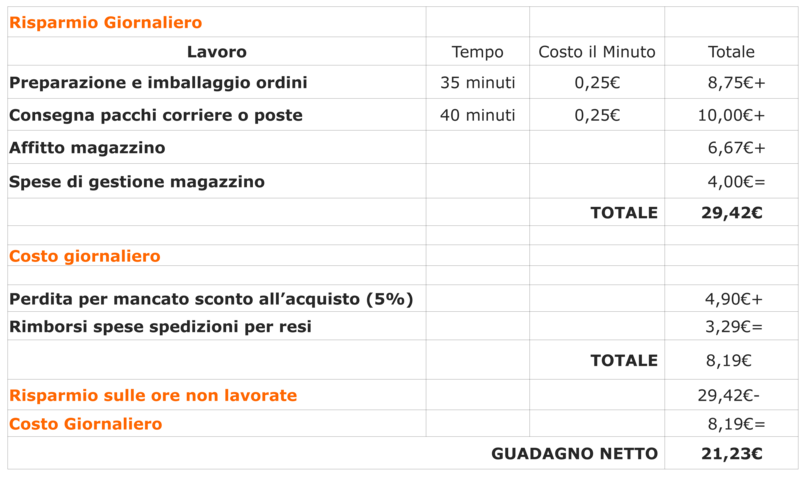 Paolo uses a simple calculation tool his last job, where the hourly cost was € 15.00 per hour. The economic saving that gets in the installation of the articles is € 240.00. Obtained from the sum of the 16 hours calculated to install the products X € 15.00 cost per hour. It will also save daily, because it avoids preparing and delivering parcels, equal to € 18.75 (1.25 hours X15 €). Paolo calculates inventory savings, management costs and packaging costs. to make a decision you do not need to have the exact numbers, an estimate is sufficient. Paul also makes a calculation of the lost discounts because he does not buy wholesale. Estimate 5% on the wholesale price. his conservative estimate is that one order in 20 may end badly. to keep its level of service and professionalism high. each at an average cost of € 9.50, one will have to reimburse. to decide if it is better to work with Bazarissimo. Now Paul compiles all the costs and save on a daily basis assuming that he will have an average of 7 orders a day. In the start-up phase he saved € 240 because he did not have to work for photos and descriptions. It also has a big money saving to avoid having to buy the goods to be deposited in the warehouse in advance. Paolo must also add the profit that comes from the sale of products. I have to be honest: “It’s not a perfect solution in everything”. Just imagine the money you save because you do not have to buy the products before selling them. and if I do not sell them? “. You do not have to buy cameras dedicate hours to take the right picture for each product. so they are more appealing to the type of customers you want to contact.